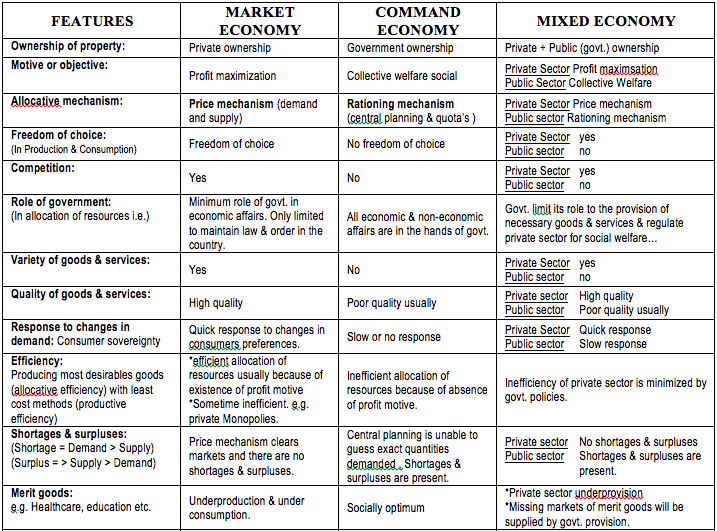 Ha-Joon Chang’s book ‘A Pelican Introduction – Economics: The User’s Guide’ has a table in which he summarises the different schools of economics. I have just included some of them as these tend to be associated with the CIE AS Level and A2 Level courses. This entry was posted in Economic Systems and tagged Keynes, Marx, New Classical on January 28, 2019 by Mark. Karl Marx – relevance today? Very good summary from The Economist – Karl Marx remains surprisingly relevant 200 years after his birth. He rightly predicted some of the pitfalls of capitalism, but his solution was far worse than the disease. Some informative graphics on Banking Crisis and Poverty – see below the video. This entry was posted in Economic History, Economic Systems, Uncategorized and tagged Marx on June 12, 2018 by Mark. With the AS Data Response and Essay Paper next week here is some revision material on economic systems. It goes through the features of the market, command and mixed economies. Below is a screenshot of the information but you can download the word document by clicking on the link – ECONOMIC SYSTEMS. This entry was posted in Economic Systems and tagged Command Economies, Market Economies, Mixed Economies on October 15, 2017 by Mark. The best way to describe different economic systems is with cows. It keeps it simple and easy to understand – from NewstalkZB – you can view them all here. This entry was posted in Eco Comedy, Economic Systems on September 29, 2017 by Mark. Part of the excellent Al Jazeera documentary series about Russia, which addresses the problems facing many Russians today. The global economic crisis, conflicts with neighbouring countries and the drop in oil prices all played their part in the demise of the Russian people. There is a very good interview with the former Central Bank Chairman Viktor Gerashchenk who held the position during Yelstin’s reign. He explains very simply how you grow your economy and that there must be money in the banks so that companies can borrow and invest. Buying US Treasury Bills was loaning money to the US and paying for their deficit. Meanwhile the infrastructure and public services declined rapidly causing a lot of anguish amongst the people. You can’t suddenly jump from a socialist system into the free market. Worth a look. This entry was posted in Economic History, Economic Systems, Labour Market, Macro and tagged Central Banks, Russia on March 31, 2017 by Mark. Following on the theme of economic systems and North Korea, below is a documentary from the BBC Panorama programme. John Sweeney goes undercover in North Korea and finds out what life is really like. The documentary shows: State ownership, State control, price controls and extreme government failure in poor quality goods and services, massive shortages, and crippling unemployment. He does venture over the border to South Korea where the experience is in stark contrast. Good video to finish off the market systems topic. This entry was posted in Economic Systems and tagged North Korea, South Korea on February 14, 2017 by Mark.